Soybeans in Indiana often show potassium (K) deficiency symptoms during seed fill – leaf margin chlorosis to necrosis. Although the symptoms are classic in many respects, one aspect of their occurrence differs from the norm — the symptoms are occurring on the youngest uppermost leaves, oddly enough, rather than on the older lower leaves (Figure 1). Figure 1. Soybean leaves expressing chlorosis to necrosis along the leaf margins of the uppermost leaves (youngest) during seed fill. Picture courtesy of Brian Mitchem in Allen County, IN. As the deficiency continues and the severity increases, the necrotic leaf margins can simply drop off the plant resulting in a ragged or tattered appearance (Figure 2). Iowa State Extension specialists described this condition in Iowa several years ago, referring to it as ‘Soybean Top Dieback’. X.B. 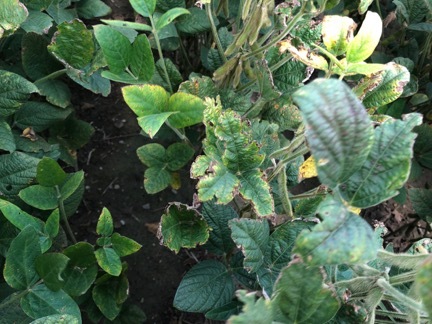 Yang and John Sawyer describe the condition in the newsletter article Soybean Top Dieback Shows up in Iowa Again. Figure 2. Severe potassium deficiency during soybean seed fill where the uppermost leaves appear tattered or ragged as the necrotic tissue of the leaf margins drop off. Picture courtesy of Brian Mitchem in Allen County, IN. Low soil test K has been found in association with Soybean Top Dieback. 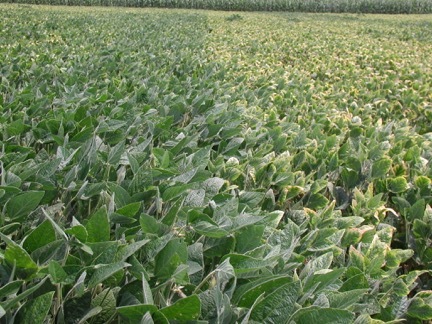 Samples from Indiana fields exhibiting K deficiency symptoms on the upper leaves have been sent to the Purdue Plant and Pest Diagnostic Laboratory (PPDL). Although SCN and Phomopsis and Diaporthe spp. have been found in association with these symptoms in previous years, there is no proven correlation between the presence of these fungi and SCN and the top dieback symptoms. Additionally, fields that have adequate soil test K have exhibited the same leaf symptomology during seed fill when soil moisture was limited and/or root systems were compromised (i.e., limiting water and K uptake) since the K demand was so high. Root restrictions were often related to compaction (e.g., tillage pan, sidewall compaction at planting, wheel traffic of equipment) or even early to mid-season root death due to saturation conditions. 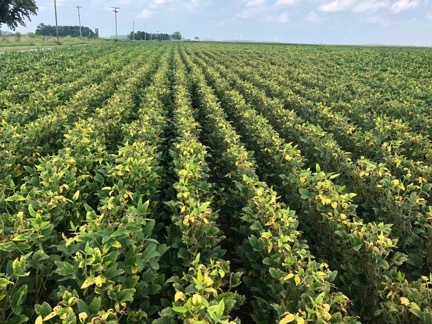 Tissue analysis of soybeans showing symptoms of Soybean Top Dieback from three different Indiana fields showed only 0.60% K in the uppermost fully expanded trifoliate leaf, well less than half of the critical level. Soil test K levels in these soils were also extremely low, <55 parts per million for soils with cation exchange capacity ranging from 8 to 18 meq/100g. Sufficient soil test K would be 100 parts per million or higher. Several K trials conducted on Purdue farms in past years show K deficiency symptoms in the youngest leaves during seed fill (Figure 3). Figure 3. Adequate soil test potassium in the soil of the soybeans on the left vs. deficient soil test potassium in the soil of the soybeans on the right. Notice leaf margin chlorosis to necrosis on the uppermost leaves during seed fill. Picture from Southeast Purdue Ag Center. Soybean accumulate substantial amounts of K. In recent research1, a 66 bu/acre crop took up approximately 150 pounds of K2O/acre and about half was removed from the field in the grain. Seventy-five percent of the uptake occurred after R1 (beginning bloom), during reproductive development. Uptake from the soil was complete around R5 (beginning seed) at moderate and low yields (66 bu/acre or less), but continued through seed fill (R6) at high yield levels (>75 bu/acre). During seed fill, more than 75% of the K delivered to the seed arose from remobilization from pods, stems, petioles, and leaves. Remobilization from pods, stems, and petioles commenced when seed fill was initiated, but leaves retained their K until near the end of seed fill period. Similar results were obtained in another study2. Also, early-season K deficiency may not occur because of lesser K demand of smaller plants and adequate soil moisture conditions that enhances K uptake. Potassium deficiency is often confused with SCN damage, and in fields where SCN populations are high, low-K conditions can intensify SCN symptoms. Identifying fields with high SCN populations and low soil test K should enable improved management of next year’s crop by controlling those two issues. With the fields that have adequate soil test K that still exhibit K deficiency during seed fill, efforts should be made to relieve and prevent sources of compaction or limitations to root development. For more information contact: Jim Camberato (765-496-9338, jcambera@purdue.edu) Shaun Casteel (765-494-0895, scasteel@purdue.edu), Gail Ruhl (765-494-4641, rhulg@purdue.edu) or Darcy Telenko (765-496-5168, dtelenko@purdue.edu). 1Gaspar, A.P., S.L. Naeve, and S.P. Conley. 2018. Understanding nutrient requirements and utilization for high-yielding soybeans. 2Bender, R.R., J.W. Haegele, and F.E. Below. 2015. Nutrient uptake, partitioning, and remobilization in modern soybean varieties. Agronomy Journal 107:563-573.